A profit slowdown clashed with high expectations to send shares sharply lower last year. Shares of sports apparel specialist Under Armour (NYSE:UAA) (NYSE:UA) declined 28% in 2016, according to data provided by S&P Global Market Intelligence. Shareholders at one point in the year were up more than 15%, but those gains gave way to minor losses, which then spiraled into a significant calendar-year decline. Zooming out, the stock is still soundly beating the market over the trailing three-year, five-year, and 10-year time frames. 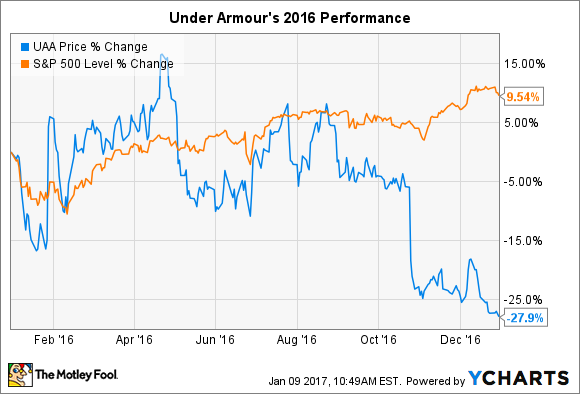 Last year started off on a strong note that seemed to justify Under Armour's high stock valuation. The retailer's first quarterly report included 31% sales growth thanks to spiking revenue in the footwear category and an impressive expansion to international markets. 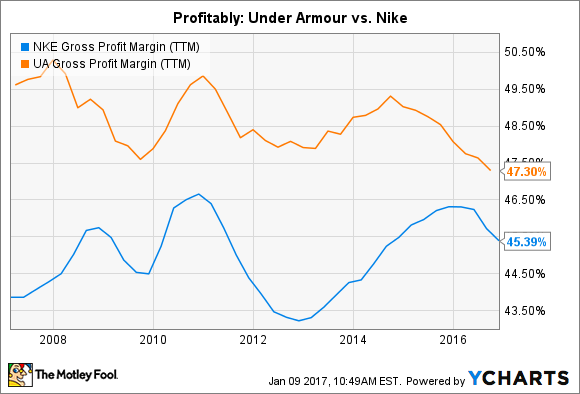 Sure, profitability declined, but only because Under Armour was soaking up market share in the athletic shoes segment. CEO Kevin Plank and his executive team were confident that those gains would power strong financial results. Under Armour in early January issued an initial 2016 forecast that called for sales to rise 25% to $4.95 billion as operating income improved by nearly as much to pass $500 million. The year didn't turned out quite that well. Due to the liquidation of major customers like Sports Authority, management had to lower its 2016 sales guidance. But investors were even more concerned with the worsening earnings growth picture. Under Armour now expects to book less than $445 million of operating profit for the year. Like rival Nike (NYSE:NKE), which was the Dow's single worst performer in 2016, Under Armour's business was hurt by a slowdown in the core U.S. market that forced price cuts. The company's gross profit still beats Nike's, but it is now below 48% of sales for its lowest result yet as a public company. With growth clocking in at over 20% last quarter, Under Armour seems set to continue its awesome sales expansion streak. On the other hand, shareholders can't count on a quick earnings rebound. Instead, management recently lowered its long-term profit outlook as the company prepares for what looks like a tough market share fight against Nike and other rivals. Investors are still willing to pay a premium for Under Armour's faster growth pace. But the stock's valuation gap slipped last year to account for the likelihood that those sales gains won't power as much profit as Wall Street hoped. At a valuation of 40 times earnings (compare to Nike's 24), the stock could get cheaper. But I wouldn't bet against a company that just posted its 26th straight quarter of 20% or better sales growth.